Follow our step-by-step, photo illustrated recipe for making this quick and easy snack or appetizer. Great for your family meal, or for your next party or get together. Only three ingredients are needed. Printable recipe included. These easy to make roll ups are very versatile. You can use them as a side for your family meal, as a snack, or cut them smaller and serve as appetizers at your next family get together or party. 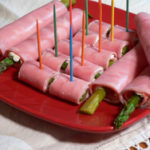 Our Ham and Asparagus Rollups is another recipe from my families cookbook that was created for our annual family reunions. Sadly, we’ve given up on them nowadays. Years back, the group put together some favorite recipes from various family members, and turned it into a small cookbook called the “Stewart Family Favorites.” My mother was a Stewart before she married my dad. Cousin Elaine submitted this particular recipe. It only takes three ingredients to make, and as mentioned, it’s very versatile. 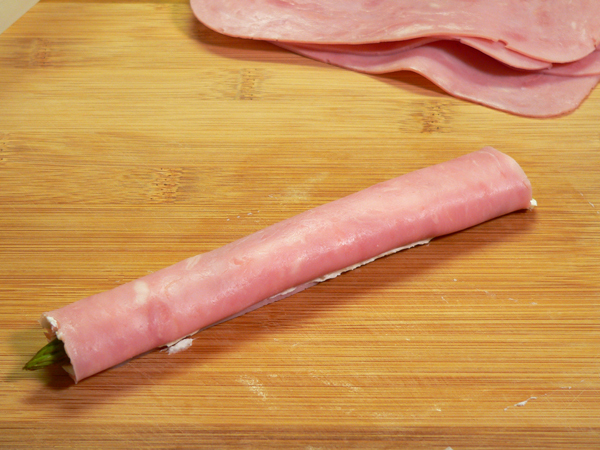 These are often made with a Proscuitto Ham, but we’re using something a little less expensive here with our Deli Ham slices. I used fresh asparagus. There is a canned variety, which I tried, but the fresh is much better. Ready to give them a try? Alright then, let’s get in the kitchen, and… Let’s Get Cooking. 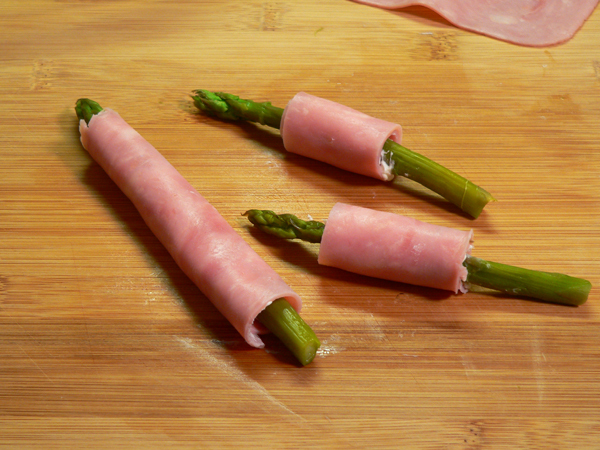 Ham and Asparagus Roll Ups recipe: You’ll need these three ingredients. I’m using fresh asparagus here. You could use the canned variety, or even frozen. Frozen asparagus should first be prepared according to the package directions. I tried this once with the canned variety but it was just soggy and broke easily. I can’t speak for the frozen stuff but as you know, fresh is always better when you can get it. 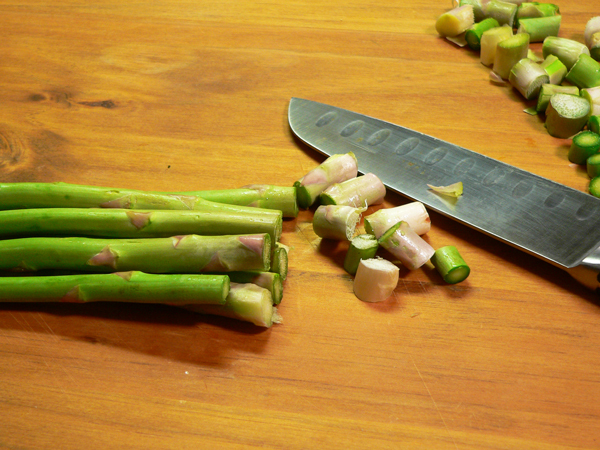 Trim the ends from your asparagus. This part is usually tough and stringy. And, although I did trim a bit off, I ended up trimming them again after they were cooked because most of the ends were still kind of tough. 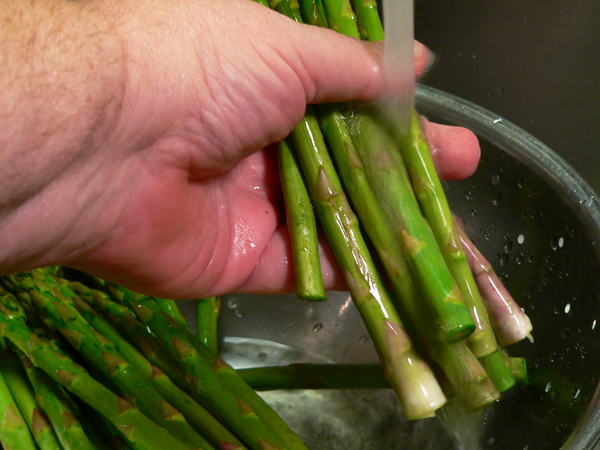 Gently wash the asparagus under cool running water. I want to steam these. It takes a bit longer, but I think it’s worth it. 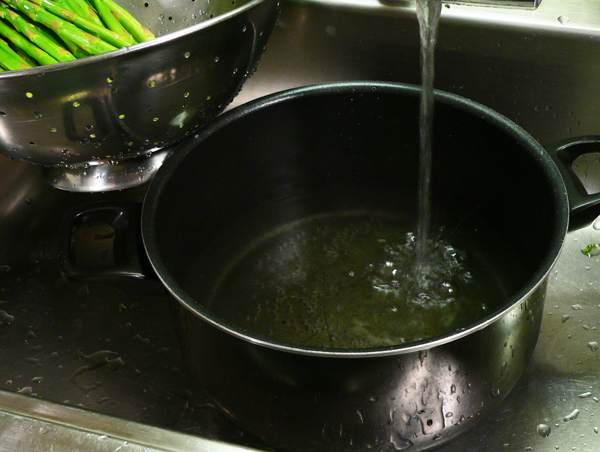 My colander will serve as a make shift steaming basket, so I added a couple of cups of water to a large sauce pot first. 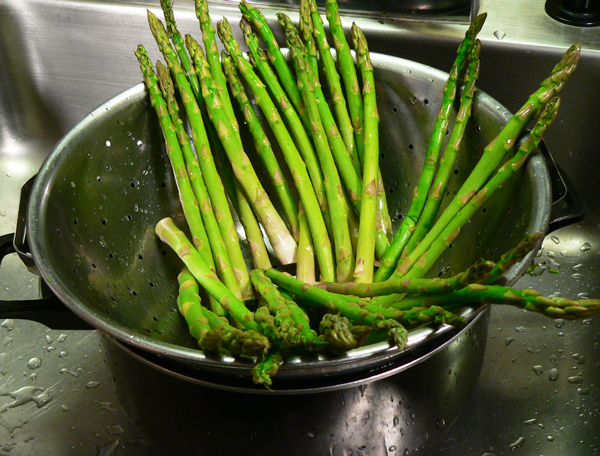 I placed the colander in the pot, then stood the asparagus up around the edges. My make shift steamer was then placed over Medium-High heat on my stove top. 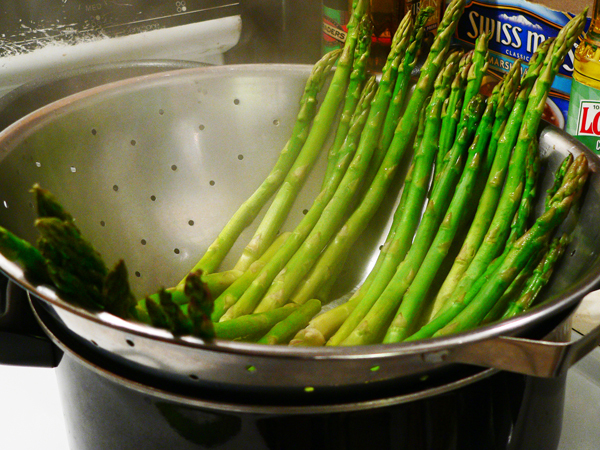 I let the water come up to a boil, and let the asparagus steam until it was tender. As I mentioned, this process takes a little more time. 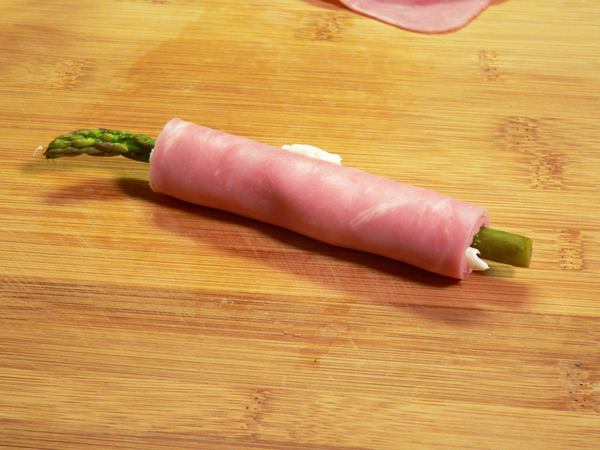 There are a good number of ways to cook asparagus, even in the microwave, but I just chose the hard way. Smile. It took a good 25 minutes to steam it until it was tender. With it standing up this way, the thicker ends will cook first, then the smaller ends higher up will not overcook so easily. Once it’s tender, remove it from the heat and “shock” it by running it under some cold water. Or, you could place it in a large bowl filled with ice water. This will stop the asparagus from continuing to cook once it’s removed from the heat. Next, I rolled it all up in a couple of layers of paper towels to dry. You’ll want to have your cream cheese at room temperature for easy spreading. 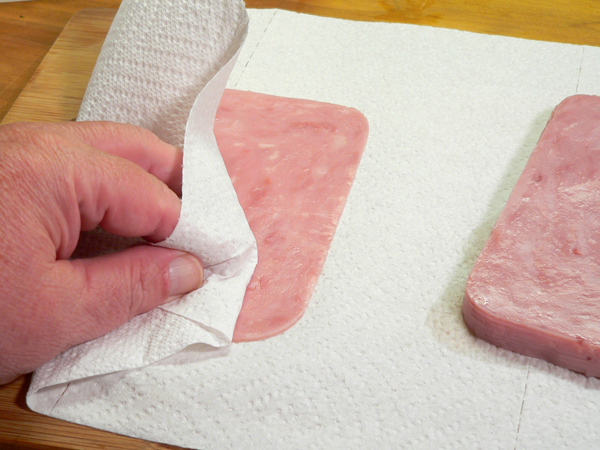 Pat each ham slice to dry up any liquid that might be on it. 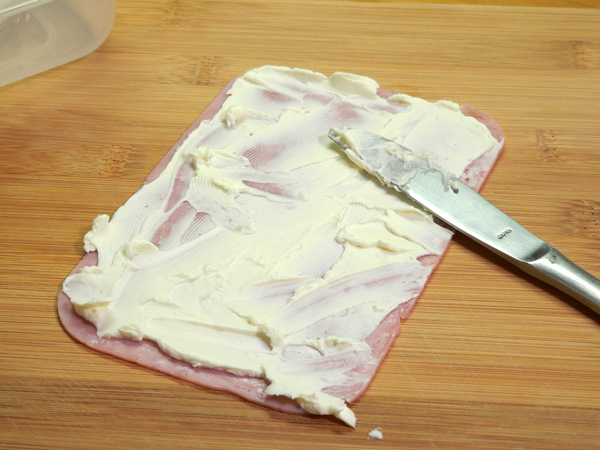 Spread each ham slice with a thin layer of cream cheese. Be sure to spread it to the edges. 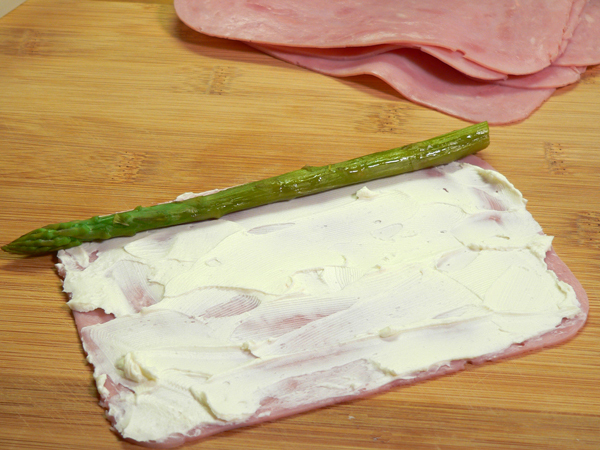 Place a piece of Asparagus on one edge of the ham. The cream cheese acts like a glue to seal the edge closed. 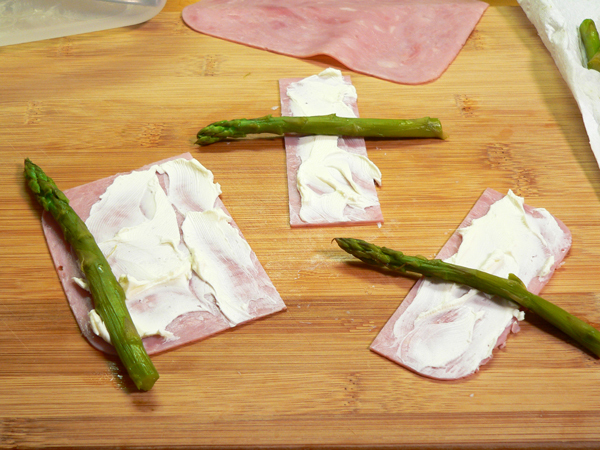 You could also place the asparagus the long way. Then, slice it into small bite sized pieces. Or, how about one of these? 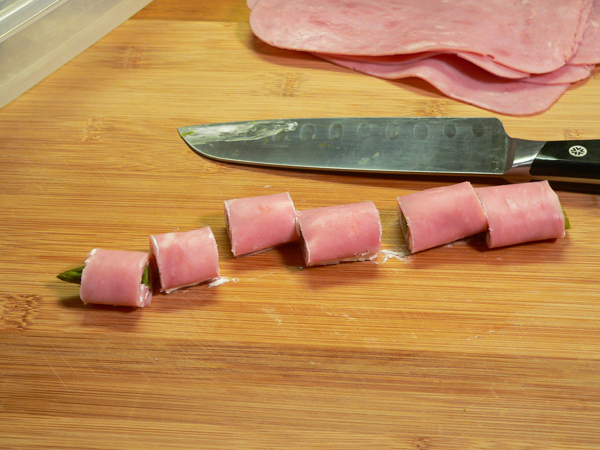 Cut a slice of ham in half, then roll it up. Or, even into quarters if you really want to stretch it out. The choice is yours. Make a variety for everyone to select from. Frilly toothpicks would give this more of a “party” look. Use them if you have them. The roll-ups can be served at room temperature or cool. You could easily make these a day ahead of time, cover and refrigerate them, then serve them when needed. Make some small one’s for the kids, bigger one’s for the adults, because I’m pretty sure they’ll be going back for more. While you’re here, check out our other appetizers by clicking… HERE. Follow our step-by-step, photo illustrated recipe for making this quick and easy snack or appetizer. Great for your family meal, or great for your next party or get together. Only three ingredients are needed. 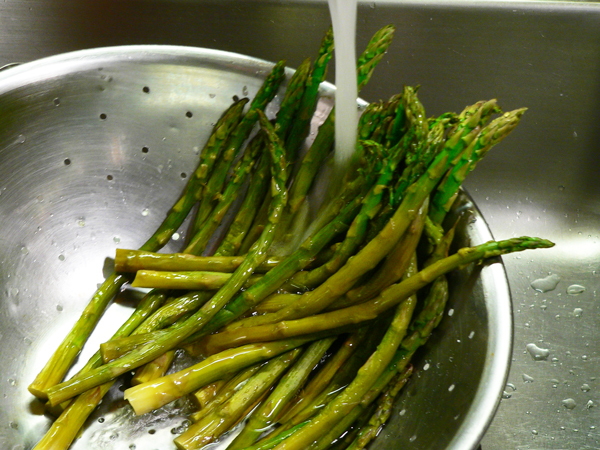 Rinse the asparagus under cool running water. Shock under cold water to stop the cooking process. 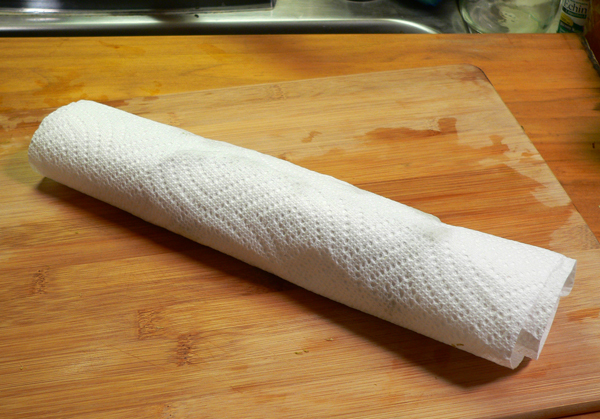 Roll in paper towels to dry. 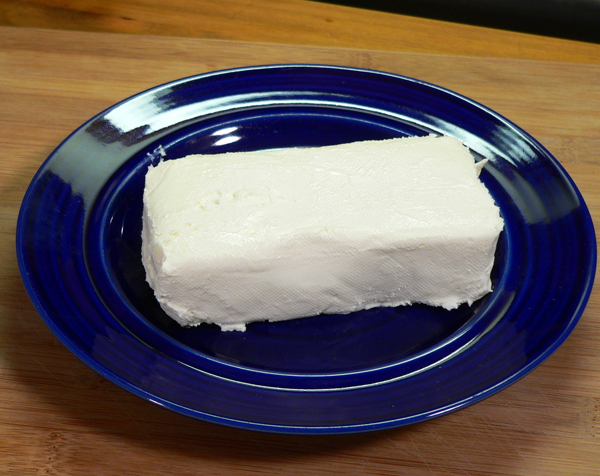 Have cream cheese at room temperature for easier spreading. Pat ham slices dry with paper towel. 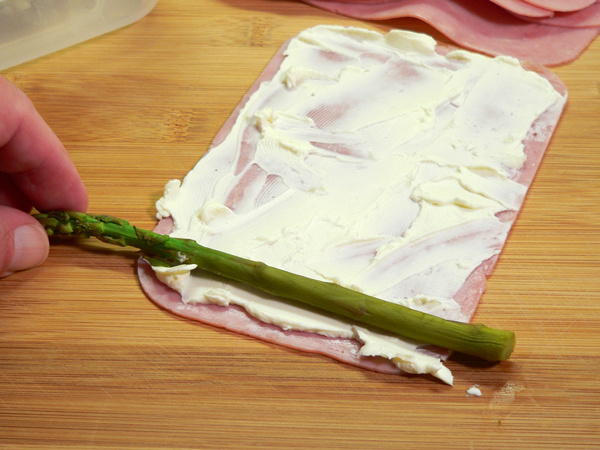 Place one piece of asparagus on the edge of the ham slice. Roll up tightly, sealing the end closed with cream cheese. Serve cold or at room temperature, whichever you prefer. 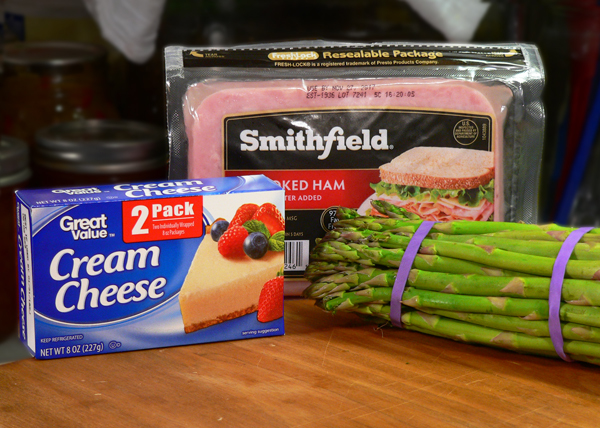 If desired, you can also make these with thinly sliced Turkey instead. Your Comments: Have you ever made this type of roll up? How do you like to make them? What’s your favorite go-to appetizer. Thank you! This is exactly what I’m looking for. I will be making these for a Christmas party. The serving table will be crowded without access to an outlet so I need a meat dish I can serve cold. I have an asparagus hint for you. To remove the hard ends, just hold a spear with two hands and bend it. It will break between the hard part and the edible part. No guess work. My husband’s aunt here in Ohio made something similar for many years. Instead of asparagus, which is surely healthier, she used bread and butter pickle spears (my husband’s family are farmers from western Ohio, and I am certain the pickles were homemade). 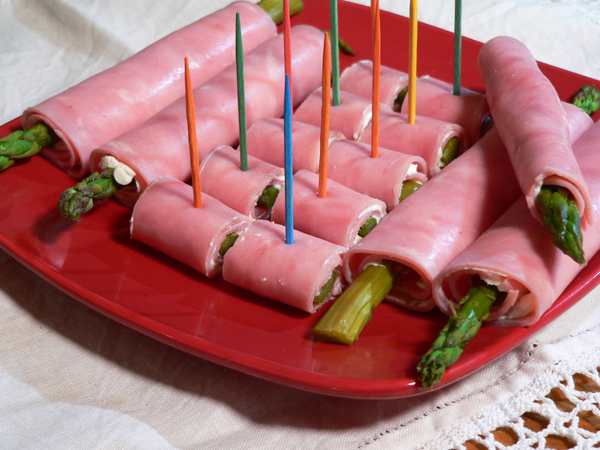 She thoroughly dried the pickle spears off, and rolled them up just as you did, in ham slices spread with cream cheese. And then she sliced them into bite-sized pieces with a toothpick to keep them together and to make them easier to pick up. Like everything else she made, they were delicious. Hi, back at you. We’re doing okay, except for the 103 degree temperature here in Southern California. Someone forgot to tell the weather that it is the middle of October…makes it very hard for the firefighters and other first responders. Could you send a little of your cooler weather out to us? Love this recipe — simple, yet yummy. Think I’ll take some to the family Thanksgiving meal, but of course, will need to do a test run first, right?! ?